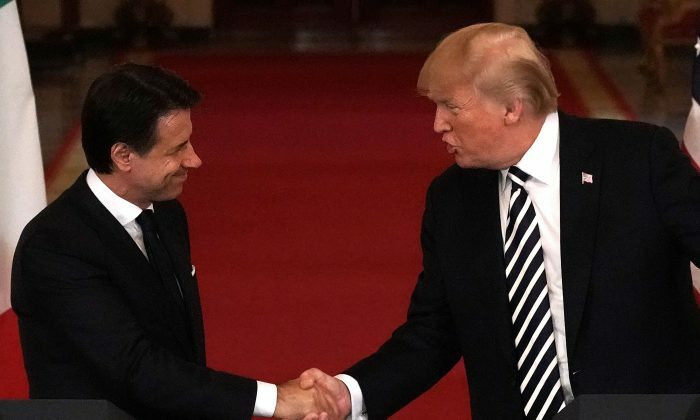 WASHINGTON—President Donald Trump hosted Italy’s new Prime Minister Giuseppe Conte at the White House on July 30. Both leaders announced a new strategic dialogue on a number of issues including immigration, commerce, and combating terrorism. Both leaders have been notably complimentary to each other since the Group of Seven (G-7) summit in Canada in June. “We had a very good G-7 meeting, where Giuseppe and I became friends,” said Trump during a joint press conference at the White House. “I think we were probably more closely aligned than anybody else in the room,” he said referring to the summit where trade tensions took center stage between Trump and other European leaders. Conte, in response, endorsed Trump’s stances on trade, NATO, and Russia. During their meeting at the White House, Trump and Conte expressed alignment on immigration issues, as Trump supported Conte’s hardline immigration stance. Illegal immigration became a pivotal issue in the Italian election held in March this year. Italy, as a first port of call for those arriving by boat, has become a focal point of Europe’s wider immigration challenge. And the new Italian government’s decision to bar the immigrants underlined the deep divisions in Europe over how to handle an influx of people mostly from the Middle East and Africa. During the meeting, Trump reiterated his threat to shut down the government, calling the U.S. immigration law, the “worst” in the world. Conte applauded the recent trade agreement between Trump and European Commission President Jean-Claude Juncker. The United States and the EU agreed on July 25 to work together to eliminate tariffs and other trade barriers on all industrial goods other than cars. The Trump administration agreed to put on hold any new tariffs, while the EU pledged to increase imports of American soybeans and liquefied natural gas (LNG). Both parties will also cooperate against unfair Chinese trade practices and work on reforming the World Trade Organization (WTO). “It’s a years-old system,” said Conte, referring to WTO, calling it “not well-functioning” and “not well-rational” organization. Trump said Italy and the United States also agreed to combat “unfair foreign trade practices from non-market economies,” referring mainly to China. “They’re brutal, but we’re winning,” Trump said. Conte said their position regarding Russia has not changed and they are still open to dialogue. “We do believe that Russia plays a fundamental role in all international geopolitical crises,” Conte explained. In June, both Trump and Conte called on the G-7 leaders to reinstate Russia as a member. Trump said it would be an asset to have Russia back in the group. “We’re looking for peace in the world. We’re not looking to play games,” Trump told reporters in June. Russia was suspended from what was then the G-8 after the annexation of Crimea in 2014. Conte has also supported Trump’s stance on Iran and NATO. Both leaders agreed on dismantling Iran’s nuclear weapons and encouraging other countries to press Iran to end its “malign activities,” said Trump. With respect to NATO, Trump said the alliance was “essentially going out of business” before he demanded change. Trump has repeatedly asked NATO allies to increase their contributions and meet their commitment to spend 2 percent of their gross domestic product for the defense alliance. Although Rome is struggling with its own finances, Conte said he backed Trump’s efforts. As a result of the pressure, Trump said, NATO members paid $44 billion more last year.